Yes, that's right. It's the hottest day of the year so far and I made a Mexican Winter Salad. Not only that but I've been cuddled up to a hot water bottle all day. If you think I'm probably starting to lose the plot, you're wrong. I lost it years ago. These three events (hot day, excruciating back and leg pain, winter salad) weren't planned to coincide. I picked the recipe mostly because I seriously couldn't understand why anybody would want to eat salad in the middle of winter. Soup - definitely. Salad? Why. But then the average temperature in Cancun is 23C in January (thanks Google). Slightly different to the average 4C we can expect in the UK. Which I guess kind of explains it. So with the temperature at a toast 27, I guess today was as close as I'll get to eating like a real Mexican for a very long time. The month started with J and ended in y too. Tenuous but I feel I'm justified. Why do my salads never look artfully tossed? As I mentioned in a previous post, the standard Ingram family salad was just a bigger version of a pub side salad - lettuce, cucumber and tomato. No dressing. So to have a salad that contained none of those ingredients was a real departure. In fact, my mother would have a fit if I served her this. She doesn't like radishes and can't stand sweet things (oranges and pomegranates in this case) with meat. I have to admit that I'd made up my mind before eating this salad that I probably wasn't going to like it. I don't like licorice and so the smell of the fennel put me right off. But having never tried fennel before, it's something else I can tick off my list of things to try before I finish this blog. I've also never been a fan of pomegranates - they seem a lot of effort for very little benefit in my opinion. Plus the juice stains magnolia paint like you wouldn't believe (unless you used to own two African grey parrots who were obsessed with eating pomegranates and would flick the seeds up the wall). But this salad - like all the other Miers dishes that I've been a little apprehensive of - just worked. The balance of flavours was spot on. I especially loved the spiky sea salt and sharp feta with the sweet oranges. Served with a plain grilled chicken breast it was a delight and looked so very pretty. I didn't include the Totopos - deep fried slivers of corn tortilla - purely because I'd've eaten way too many of them and having been put back on the 'running bench' whilst I get over my latest 'episode' I have to watch what I'm eating even more than normal. I'm sure it would only make the salad even better. 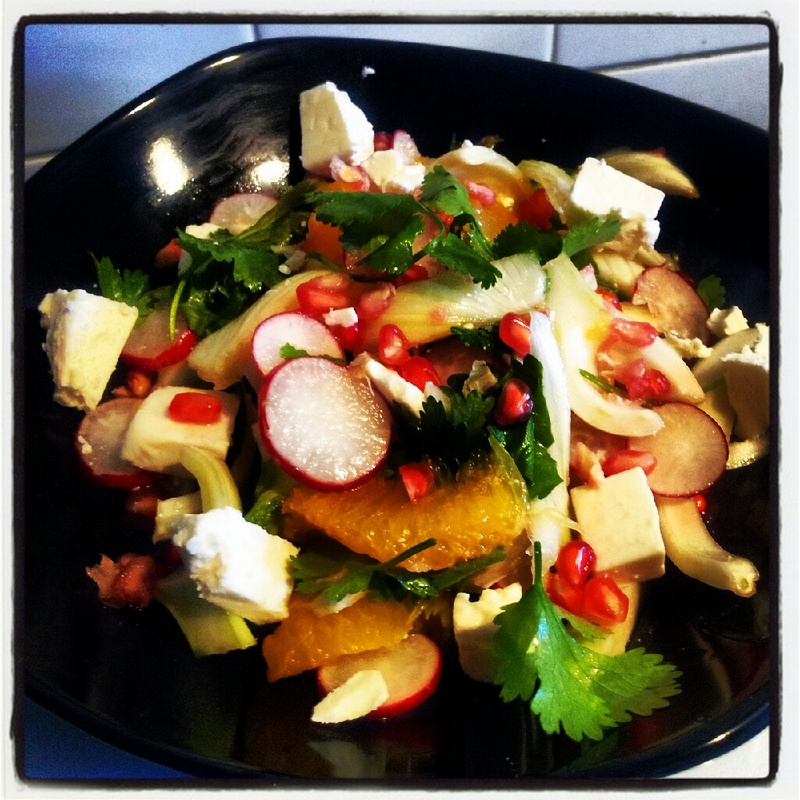 Another fine recipe from Wahaca: Mexican Food at Home. Really must start looking in some of my other books again!